» Archived Review: GEOFFREY HOMES – The Man Who Murdered Himself. Archived Review: GEOFFREY HOMES – The Man Who Murdered Himself. GEOFFREY HOMES – The Man Who Murdered Himself. William Morrow, hardcover, 1936. Avon, no number [#18], paperback, 1942. Working for a missing persons outfit specializing in lost heirs is a cutthroat business, at the fringe of legal niceties, requiring a stretch of the truth now and then, with a little money every so often into the right hands. So we meet Robin Bailey, ex-newspaperman, on a case of either suicide or murder — death by personal pollution of a local reservoir. Crackling dialogue and a twisting, turning plot, but short but effective glimpses of character and existence in the 1930 leave us wanting more in that regard, while Homes concentrates on the story. Bishop himself finds his work increasingly distasteful and begins to wonder why he never before noticed the office secretary. The secondary characters, understated, unobtrusive, are even more memorable, exemplified by the sorrow displayed by the victim’s landlady. I believe this to be Homes’ first book. He’s worth looking into as a writer. — From Mystery*File #9, Vol. 2, No. 2, Spring 1976 (slightly revised). The Doctor Died at Dusk (n.) Morrow 1936. 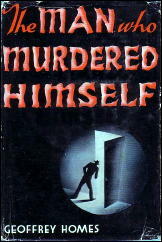 The Man Who Murdered Himself (n.) Morrow 1936. The Man Who Didn’t Exist (n.) Morrow 1937. 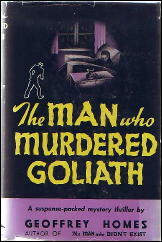 The Man Who Murdered Goliath (n.) Morrow 1938. Then There Were Three (n.) Morrow 1938. The latter is a crossover novel with the detective duties shared by Homes’ other major series character, PI Humphrey Campbell, who also works for the Morgan Missing Persons Bureau detective agency. 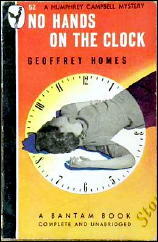 No Hands on the Clock (n.) Morrow 1939. Finders Keepers (n.) Morrow 1940. Forty Whacks (n.) Morrow 1941. Six Silver Handles (n.) Morrow 1944. The Street of the Crying Woman (n.) Morrow 1942. The Hill of the Terrified Monk (n.) Morrow 1943. 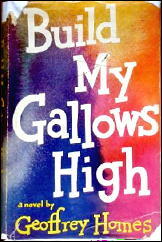 Build My Gallows High (n.) Morrow, 1946. But if anything, either under his own name, Daniel Mainwaring, or as Geoffrey Homes, his list of credits is even longer on IMDB as a screenwriter. I once tried to get Homes’/Mainwaring’s widow to let me reprint the Homes mysteries. I offered a thousand a book plus six per cent royalties for a line I was editing at the time. She was a very sweet woman who had to be well into her eighties if not her nineties. “I just couldn’t do that. Dan used to make ten thousand a week at the studios.” They had been out of print for five decades. That’s too bad. It would have been money in the bank for her. It also explains why Mainwaring stopped writing books when he did. The money that publishers could pay for more novels just wouldn’t have been nearly enough. That’s a great story about the widow, it has rather a Norman Desmond aspect. I collected several of this author’s books, because they sounded rather interesting from a detection standpoint. I read a great old interview with him somewhere where he spoke rather dismissively of his earlier books, as I recall. By the way, does is anyone else reminded of “Tarzan” by that book cover (one I have)? Oops, and that should be “Norma” unless there was a brother I don’t recall (maybe he changed his name to Norman Bates?). Mainwaring/Homes is one of the great neglected hard boiled writers (Kurt Steel, Cleve Adams, and Jonathan Latimer among the others). 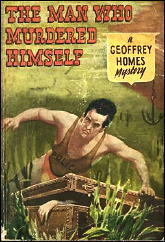 He could do the slightly hard boiled mystery like this one, the slightly screwball private eye like the Humphrey Campbell novels, or the serious hard boiled eye as in GALLOWS (OUT OF THE PAST)all with equal skill, and like Jonathan Latimer and Kurt Steel seldom let the hard boiled aspect get in the way of the detective story. Sorry to hear that his widow opposed the reprints, but then a lot of the early writers in the field have a dismissive attitude to their early work. It was in part a defensive attitude to protect themselves against the prevailing attitudes of the day, and in part genuine. Then too, you have to remember that when Homes began writing these a novel might only bring in from $500 to a $1000 for hardcover rights. No wonder he, Latimer, Stuart Palmer, Brackett, Rice, Richard Lockridge, Frank Gruber, Paul Cain, John K. Butler, Eric Taylor and so many others defected to the screen. But it would be nice to see the Homes books back in print. Luckily they are not too hard to find — or at least they weren’t back when I was collecting them. The cover reminds me of Harry Houdini doing his escape from the trunk that was plunged into the Hudson River. We’re in sync, John. What else can I say? Just reading Chump Change by Dan Fante and on page 101 of the 1999 imprint, he refers to Daniel Mainwaring. Is it worth getting hold of Mainwaring’s stuff? I haven’t read any but am always on the lookout for good books. He seems to have been somewhat overlooked. which is the general consensus of other fans and readers of his work that I know.